Looking for a bar with a good theme? It seems like the simple act of drinking is a theme all by itself here in Sin City, but some bars go the extra mile to present a distinctive image and atmosphere. 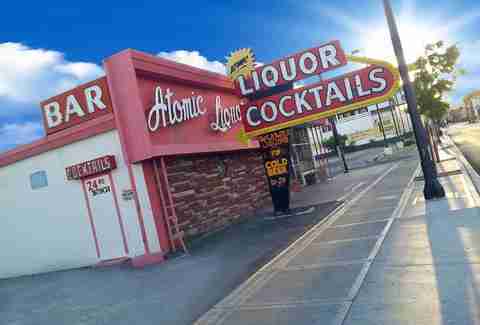 While a few of these places are wacky and silly, others represent some of the most compelling elements of Las Vegas history and culture. All of them are worth a visit. 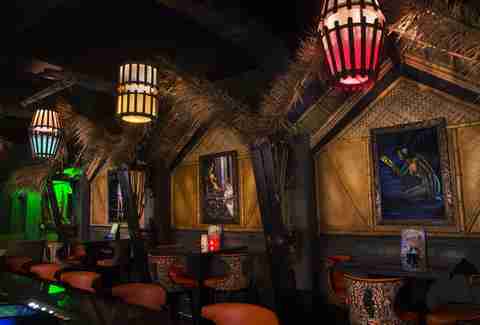 Tucked inside a Chinatown shopping center, you'll find a mysterious detour into "Skull Island" -- a tropical tiki paradise where the lights are low and the drinks are loaded with rum. Among the kitschy highlights are a waterfall, giant clamshell chair, and a skeleton who pilots his (her?) own pirate ship for 24 hours straight, including two happy hours (2-6pm and 4-8am). If you want an old-school tiki alternative, Frankie's Tiki Room pulled off the gimmick first near Downtown. 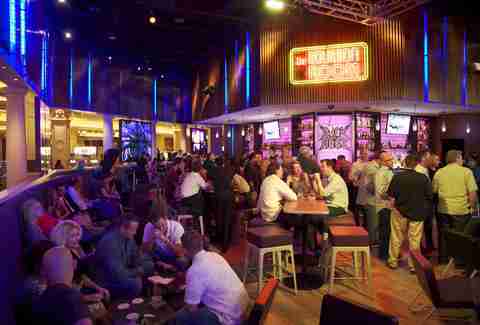 There's more than a few places to line dance in Vegas, but Gilley's is the only bar that goes chaps-and-all with the country theme on the Strip. Square off and do-si-do while the DJ cranks tunes from the likes of Tim McGraw and Shania Twain; if you crave more boot stomping, there's a mechanical bull, the barstools are built like saddles, the ladies are dressed in bikinis and chaps (could there possibly be a better uniform? ), and the spot rounds out the Texas theme by serving some of our favorite BBQ in Vegas. A bar and restaurant that could make Mother Russia proud, Red Square celebrates the communist glory of the Soviet Union, long before glasnost and perestroika came along. 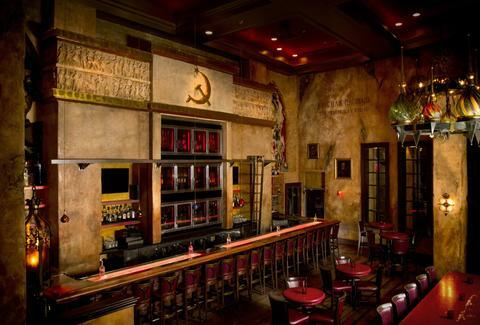 The bartenders can wield a corkscrew or shaker cup like a farm laborer wields a hammer and sickle. Of course, the vodka selection is among the best in Vegas, and it's hard to miss the place, thanks to the headless statue of Vladimir Lenin outside. (Revolution!) Curious where the head went? You can actually do shots off the top of it inside a small tasting room next to the bar, kept at Siberia-level temperatures to make sure the vodka stays ice cold. If you can't visit a global attraction in person, chances are pretty good there's a knockoff in Las Vegas. We've got our own versions of the Sphinx, Statue of Liberty, Eiffel Tower, and if you venture just east of the Strip, a full-scale reproduction of Germany's most famous beer hall. Hofbräuhaus features long tables where you can eat Bavarian sausage and pretzels, and giant steins for all of your German-inspired beer-swigging needs. Arena rock and '80s hair metal live on at this lively and energetic casino bar, with classic videos playing on a wall of TV screens and bartenders dressed in concert T-shirts and wild teased-up hair that would make David Lee Roth jealous. The Bourbon Room opened a few years ago in conjunction with the Rock of Ages stage production (in which the story unfolds in a Sunset Strip bar of the same name). 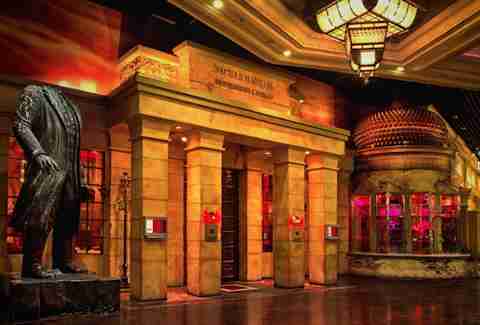 The show has since moved to the Rio, but The Bourbon Room remains at the Venetian (for now). Back in the good ol' days, atomic bombs were tested just outside Las Vegas in the Nevada desert. People used to watch them (from a distance, of course) like they would a lounge act or sporting event. One of the best spots to catch a view was from the roof of Atomic Liquors. Yes, this classic bar has been around for a while. 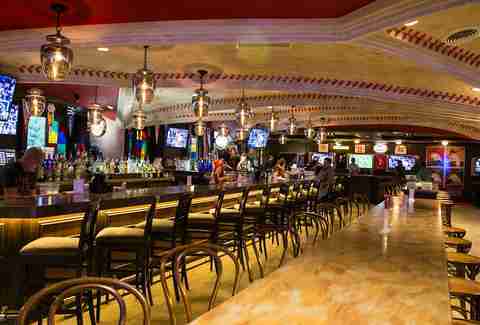 Today, it's still a popular place to grab a drink and learn about Vegas history. The walls feature newspaper clippings, signs, and artwork from the era of the mushroom cloud. So whatever happened to all that nuclear fallout? Wind patterns sent most of it to Utah. At least that's what they tell us. Much more than a "theme"... because once you're a Marine, you're always a Marine. 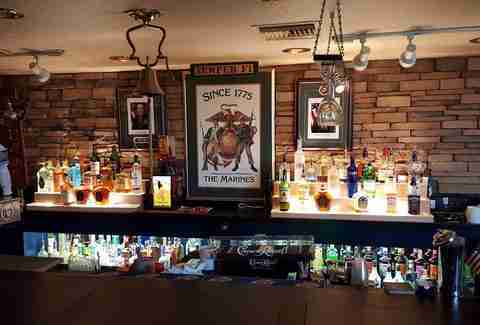 This bar is run by and dedicated to the "few and the proud" but is a popular hangout for all of our veterans, and anyone who just wants to have a good time with a burger or beer. The walls are covered with military memorabilia, artwork, and posters, with different sections dedicated to each American war. Don't forget to say hello to the bulldog mascot who's usually hanging out near the front door. The entire bar is kept at frigid temperatures, which can be a nice change of pace from the triple-digit heat that scorches Vegas during the summer months. Everything from the seats to the shot glasses are made from ice. You'll be kept warm (well, warm enough) with a choice of furry coats, parkas, gloves, and/or hats available at the front door. A bar and lounge for Star Wars fans and comic book nerds, Millennium Fandom is the perfect place for cosplay fanatics to grab a cocktail and discuss the latest episode of The Walking Dead or the merits of the Ghostbusters reboot. The team behind the concept says it's basically a clubhouse with a bar to pay the bills. The busiest nights feature trivia competitions and Game of Thrones viewing parties. No smoking, no gambling, no sports. Just fandom. Former baseball slugger and Las Vegas resident Pete Rose now has his own bar and restaurant, dedicated to the sport that still stubbornly refuses to let him in the Hall of Fame over a few lousy bets. There's plenty of memorabilia on the walls and a "throne" made from wooden baseball bats. The whole thing is underneath a ceiling that replicates the red stitching on a baseball. There are a few video games and a foosball table but no video poker and NO sports betting. The menu has a few creative options like baby back ribs topped with steak for dinner and Peanut Butter Cap'n Crunch French toast for breakfast. Two bars in one, with colorful umbrellas as the main decoration. 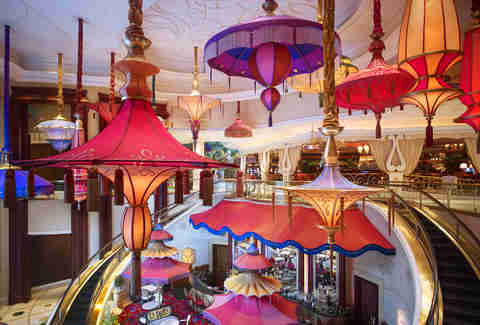 Parasol Up is on the main floor of the casino and the perfect meeting spot with comfortable couches surrounded by drapes and the Wynn's elaborate floral displays. Take the escalator downstairs to Parasol Down, a more intimate spot suited for a quiet conversation, a glass of wine, and a view of the outdoor Lake of Dreams and 40ft waterfall. The oldest bar in Southern Nevada has been around for more than 100 years and was actually purchased through a Sears catalog. It's also the place where Clark Gable was left waiting to learn about the death of his wife, Carole Lombard, whose plane crashed into a nearby mountain in 1942. The Pioneer Saloon features decorations and memorabilia dedicated to the tragedy. You can even poke your fingers into the holes where Gable put out his cigarettes on the bar itself. 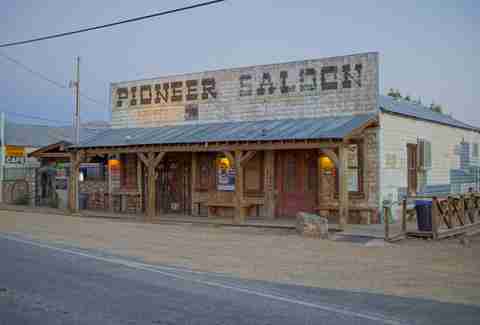 Take the sad story out of the equation, and the Pioneer Saloon still remains a landmark of the Old West and Las Vegas history. Check the walls for bullet holes before you leave. 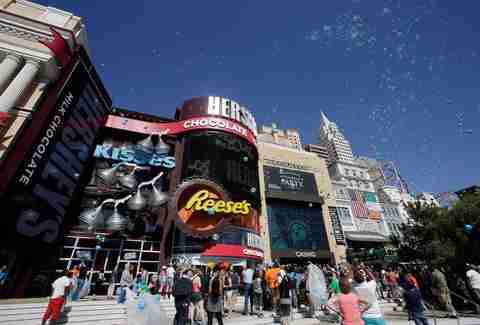 The New York-New York resort decided to unwrap something special for dessert lovers a few years ago, by opening Hershey's Chocolate World, a tourist attraction dedicated to calories and cavities. Outside the door to the lobby is The Chocolate Bar, an adults-only drinking spot with cocktails prepared in honor of your favorite sweet treats. Try the Reese's Peanut Butter Cup Martini, Hershey's Kisses Chocolate Martini, or Watermelon Jolly Rancher shot. 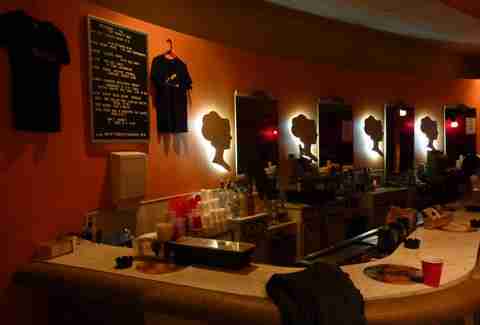 Modeled after a hair salon, Beauty Bar truly stands apart from the crowded field of watering holes in the Fremont East district. During the day, it actually offers nail and beauty services to go along with the cocktails, but at night the atmosphere shifts into high gear with two music stages and an outdoor courtyard. But you can still grab a drink and sit under the vintage hair dryer. Rob Kachelriess has been writing for Thrillist for nearly three years. He met his future fiancee at one of the bars on this list. If you want to know which one, ask him on Twitter @rkachelriess.